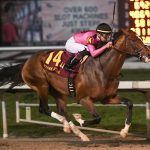 The road to the Kentucky Derby returns to Fair Grounds Race Course on Saturday for the running of the Grade II Louisiana Derby, and War of Will stands to be the heavy favorite in the 1-1/8-mile race. The Mark Casse-trained colt enters the race winning his last three starts, with the last two being stakes races at the New Orleans track. In War of Will’s last race, on Feb. 16, he won the Risen Star by more than two lengths despite starting from the outside gate in the 13-horse race. On Saturday, he’ll start from the sixth gate in the 11-horse field. Track handicappers set War of Will’s morning-line odds at 6-5. A win on Saturday would cement the colt’s status as a top contender for the Run for the Roses six weeks away. That’s impressive for the horse whose Kentucky Derby futures odds were 100-1 at William Hill in January. Now, he’s down to 7-1. 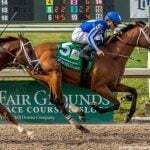 But, for the time being, the focus remains on the Louisiana Derby. War of Will’s main competition on Saturday will likely be Country House, who finished second in last month’s Risen Star. 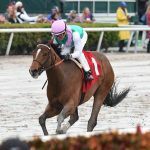 That came despite a slow start that forced him to start a couple of lengths behind the pack in his graded stakes debut. There has been some warming toward the Bill Mott-trained colt. Like War of Will, Country House started out at 100-1. Earlier this week, they were at 25-1. Country House will start from the eighth gate and posted 9-2 morning-line odds. Those looking for value on Saturday should keep an eye on Spinoff. Trained by Todd Pletcher, the colt won his last start, a one-mile allowance race at Tampa Bay Downs, by more than 11 lengths despite getting bumped at the start. Despite racing just three times, he’s already commanding 20-1 futures odds at William Hill. For Saturday’s race, his morning-line odds start at 8-1. Pletcher said he likes what he has seen from his colt since that race. 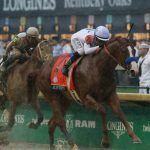 The Louisiana Derby offers 100 qualifying points to the winner, which would cement their place in the first leg of the Triple Crown. Another prep race, the Grade III Sunland Derby, takes place on Sunday at New Mexico’s Sunland Park. Mucho Gusto — a three-time winner in four career starts — goes off as the 8-5 morning-line favorite. The Bob Baffert trained colt, who has Kentucky Derby futures odds of 12-1 at William Hill, starts from the inside gate next to his top competitor, Anothertwistafate. The 3-1 selection will make his stakes debut, but he has won his last three races. The Sunland Derby winner receives 50 qualifying points toward the Kentucky Derby.